I understand they all look the same without trim (80-86). I understand the hardware difference between the 80-82 v. 83-86 -96. Anyone that can't figure that out by now hasn't read the thread, it's been beat to death! What one (or at least I) cannot figure out of this thread is what the trims are and what trucks they came on. I understood what you were going for. You want to know what year or years ran the trim panel on the tailgate and the level of the truck. Mine is 1983 XLT. I only have trim on the tailgate, along the bottom of the two tone, and the trim around the grille/headlights. Chrome bumpers also. Plain argent grille originally on mine. I have seen different trim panels on the trucks also. Did some have just chrome trim across the top and bottom of the tailgates? Yes, there was a thin piece of trim that went along the top of some tailgates with the tu-tone package. Tu-tone was avaliable on any model or trim. 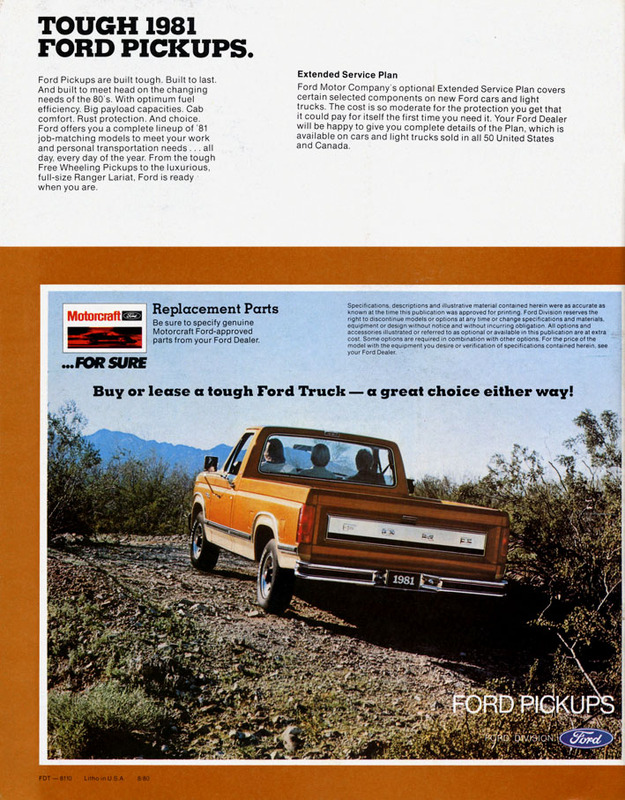 The tailgate trim panels being looked at are specific to the following years... This is not referencing the tailgate itself, just the trim piece on the gate. Will it look like this ... Of course it'll have the trim holes and probably no white paint on the lettering. Yep. Depending on whether the gate is an original or replacement, it may not have the stamped letters though. If it's a OEM (Ford Factory, Not re-pop) gate it WILL have the stamped letters correct??? I buy the wrong gate and I'll have to live with the wrath of the ol'lady for my remaining time on this earth! Don't forget, I'm only a year+ into Fords! For what it's worth, mine has the white paint. Another question... Does anyone reproduce the Red reflector piece that goes on the aluminum trim like the gate above? That image is just an imaged I ripped from the web, I didn't really want to post it for that reason. I am looking at one that's in better shape (it's a brand new stored pull from a camper lot), and has the trim like the other image in post #65. No, the red reflector piece is a part of the aluminum trim, it has to be bought together. And no one is reproducing the aluminum trim panel either. It's a very sought after, and expencive little piece in NOS condition. I took one, drilled holes from the inside ends of the gate, then plug welded the pieces back together. I did it at the inside curves of the center structure rather than at the outer edges and it held up to being used as a work bench... Only reason I don't use it right now is because the pivot mount rotted off the box, so there is nothing to hold the gate up when you open it... Sure, doing this will burn the paint, but there really isn't any way around that.